Your soil's ability to absorb and hold moisture is determined by its contents and ratio of sand, silt and clay it contains. Knowing the six types of soil and the water absorption rates benefits gardeners. It's important for determining drainage capabilities of the soil in the landscape and for choosing the best plants for the garden. There are six basic types of soil: sand, loam, peat, chalk, silt and clay. 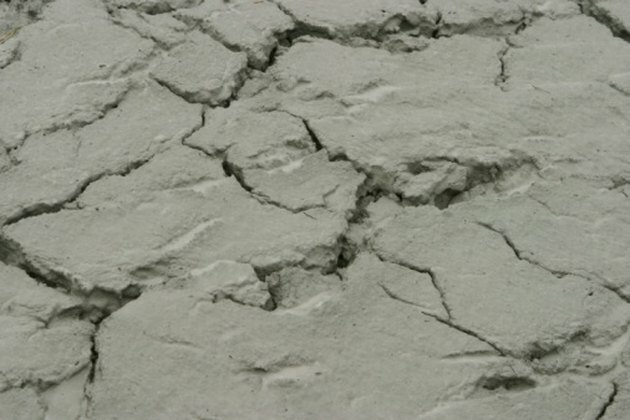 Clay soil becomes cracked and smooth when dry. Water runs freely through sandy soil. It feels gritty, warms up fast in the spring, quickly dries out and easy cultivates. Unlike clay soil, nutrients quickly wash out along with the fast water drainage. Sand absorbs as much water as it's given, but it drains quickly, making it undesirable for plants needing constant moisture. Loam soil displays good structure, absorbs water, drains well and retains moisture. Loam is full of nutrients, easy to cultivate and it quickly warms in the spring. It's the ideal soil for gardening. Loam absorbs a lot of water and retains the right amount of moisture. Peat soil is acidic. It inhibits decomposition, which means it contains a high proportion of organic matter. Peat is mostly organic. This lack of decomposition results in a lack of nutrients. Peat is dark in color, quickly warms up in spring and retains a high amount of water. Peat is an excellent soil for plants when fertilized regularly. Silty soil feels smooth in your hand. It drains well, retains moisture and is richer in nutrients than sand. Silt's soil structure is weak and compacts easily. It's easier to cultivate than clay. It makes an excellent gardening soil with proper care. Chalky soil has a pH of 7.5 or more, meaning that it is alkaline. It is stony, free draining and often found as an overlay on limestone and bedrock. This limits the availability of manganese and iron micronutrients to the plants. Yellowing leaves on a plant may indicate a shortage of these minerals. Correct this problem by treating the soil with fertilizer. The stony characteristics make silt one of the least absorbing soils. Clay soil is classified as a heavy soil and one of the most difficult garden soils. Due to its compact nature, clay is slow to absorb water and absorbs the least amount of water of all six soil types. It's hard when dry, sticky when wet, drains poorly and warms slowly in the spring. It holds the most nutrients of any soil, due to the poor drainage. Some plants thrive in clay soil, while others can thrive with generous amending.